What Day Of The Week Is June 13? 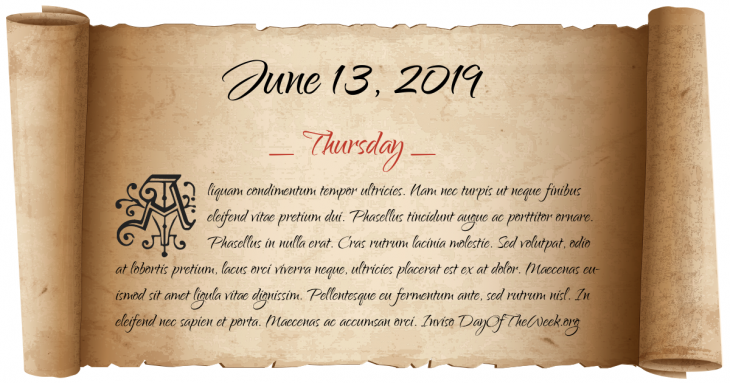 June 13, 2019 is the 164th day of the year 2019 in the Gregorian calendar. There are 201 days remaining until the end of the year. The day of the week is Thursday. Coronation of Alexander III as King of Scots. Rhode Island becomes the first of Britain’s North American colonies to ban the importation of slaves. Lewis and Clark Expedition: scouting ahead of the expedition, Meriwether Lewis and four companions sight the Great Falls of the Missouri River. Adolf Hitler and Benito Mussolini meet in Venice, Italy; Mussolini later describes the German dictator as “a silly little monkey”. The United States Supreme Court rules in Miranda v. Arizona that the police must inform suspects of their rights before questioning them. U.S. President Lyndon B. Johnson nominates Solicitor-General Thurgood Marshall to become the first black justice on the U.S. Supreme Court. Governor of Texas Preston Smith signs a bill into law converting the former Southwest Center for Advanced Studies, originally founded as a research arm of Texas Instruments, into the University of Texas at Dallas. French president Jacques Chirac announces the resumption of nuclear tests in French Polynesia. A jury in Santa Maria, California acquits pop singer Michael Jackson of molesting 13-year-old Gavin Arvizo at his Neverland Ranch. Who were born on June 13?